We build these Divator masks from new or used components (recovered from Hire or service stock) and test them to similarly, rigorous standards that Interspiro uses in production; to produce a product far exceeding the test demands of EN250 and other protocol, relevant to masks. Re-built Divator masks are not always available but we will usually be able to supply one within two or three weeks. They carry our 12 month warranty of replacement or refund, if you are not satisfied with your purchase. This is a great introduction to what is by far the most comfortable mask and best performing regulator ever made - one that will work for you and increase your aerobic performance under water. Not only is this a great offer but we include your first, annual service and check-test free of charge - all you need do is return the mask to us at the due time, we do all the work and all you will pay is the cost of return carriage - about £6 - invoiced with your returned test certificate! (*Natural/Neoprene/Styrene Butadiene, mixed compound, which is much stonger and more comfortable than Silcone rubbers). 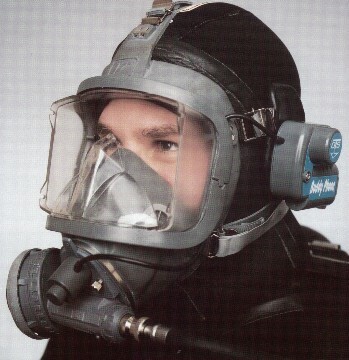 'Negative' pressure breathing valves reference themselves to the ambient water pressure: thus, when breathing in, the pressure in the mask, or mouth-piece is sub-ambient but, when exhaling, the pressure becomes post-ambient, or positive.Positive pressure demand valves produce a mouth-piece or mask pressure which is always slightly higher than the ambient pressure, so that, even when inhaling hard, the pressure is a bit higher than ambient. This has two purposes. Firstly, positive pressure masks reduce in-leakage by at least two-thousand-fold; thus preventing entry of water potentially contaminated by micro-organisms or chemicals in the water.The second function comes from the lungs remaining, throughout the breathing cycle, at a pressure slightly elevated from ambient. The result is an increase in gas transfer surface area, by about ten percent. This increases both the diver's aerobic efficiency and it increases the rate of gaseous perfusion, so that, when ascending, dissolved blood gases are removed more quickly than is the case when standard demand valves are used. Thus, positive pressure enhances diver safety in two, distinct ways. Click the button below to add the 'AGA' (Divator MkII) mask and DV assembly (standard pressure) rebuild to your wish list.